Residents prefer to spend the night out in the open rather than see their houses collapse on their heads. 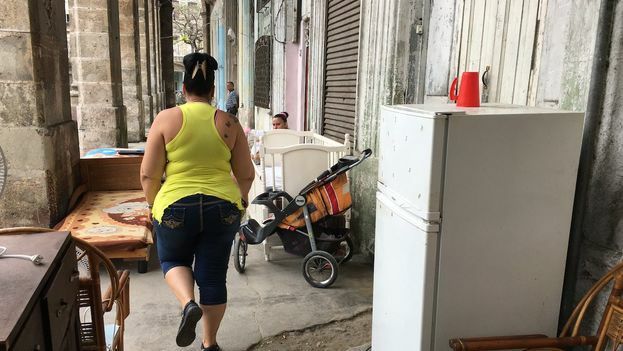 14ymedio, Luz Escobar, Havana, 28 May 2018 — A crib, a large bed and a baby stroller are the first objects passersby come across as they walk through the porticos of Zulueta Street in Old Havana. In number 505, the most desperate of the nine families living in the ramshackle building, which has been declared uninhabitable by the authorities, preferred to spend the last few days in the open for fear that subtropical storm Alberto’s intense rains could cause their home to collapse. This Saturday, several of them, including a baby just two months old, remained in the portico outside their front door. Iraida Alberto is one of those neighbors who, during the rainy days, decided on desperate measures to get the attention of the authorities. Last Tuesday she put her belongings out in the public passageway, blocking access to the sidewalk with her furniture, because of her fear that the roof over her head would collapse. The comings and goings through the covered walkway is incessant in a densely populated area of Old Havana, near the Central Railway Station. The family — the mother, grandmother and older daughter — spends the night in a bed covered with a brightly colored blanket, right in the middle of the covered walkway. 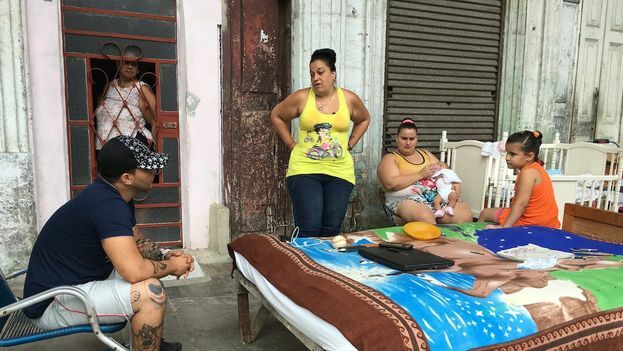 “This building has already had 23 partial collapses, eight families live upstairs in our house, although some have gone to shelters,” she tells 14ymedio, in a worried voice. Iraida Alberto, grandmother of a four-year-old girl and another two-month-old who was born prematurely, laments the indifference of the state institutions. The police, in the form of two motorized officers, show up in the portico, which is blocked by appliances and bundles. They are joined by some patrol cars and a dozen uniformed people who seem to understand the precariousness of the situation. Nevertheless, they demand that Iraida Alberto not disturb the peace by living in the walkway and “blocking the traffic.” Then they leave. “Neither the Government nor the (Communist) Party have come here,” she explains. The only representatives of some official entity that have passed through the place are those in charge of hostels in Havana, the temporary shelters for victims of hurricanes and building collapses. However, Iraida Alberto knows that moving to these places is a dead end in many cases. Cuba has a housing deficit of more than 800,000 homes. Of the 3.8 million residential properties on the island, at least a third of them are in a physical state classified as regular or bad, according to official data. When a family suffers the loss or collapse of their home, they are often relocated to a shelter. The length of stay in these sites averages 20 years and in the 120 shelters located in the capital, most of which are in old inns or industrial warehouses, more than 126,000 people are crowded, while another 34,000 struggle to find a place within them. Iraida Alberto spent fifteen years of her life in one of those places. “They tricked me into moving here two years ago, after living for fifteen years in a shelter with my children,” she recalls. The lack of privacy and the poor conditions of that accommodation increased the family’s desperation to leave the place. “When I arrived at the building, there was no scaffolding and officials told me to sign [the papers to accept the housing] before going inside because another family wanted to sneak in.” The woman did not think twice. 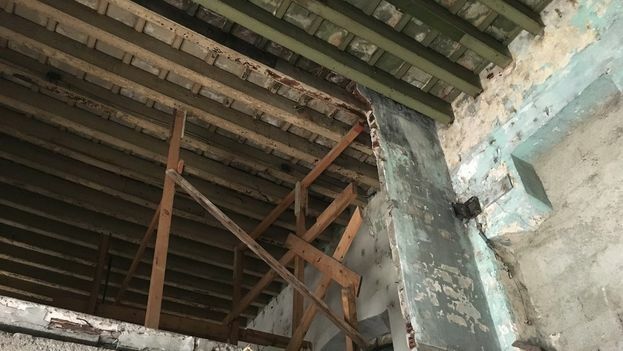 “After a few days and when I spoke with the neighbors I knew that they had already suffered eight partial collapses and that the property was declared uninhabitable. Nevertheless, they had given it to us as if it were a final solution,” she complained. The hardest thing for the woman to accept is the helplessness she feels. “The government has not given us any support, not even some food for the children. Sometimes I have to go inside the house despite the danger of collapse to be able to cook,” says Iraida Alberto. Some of the neighbors have become aware of the family’s situation and help by letting the baby, who still has some health problems due to her premature birth, spend the night in their homes. In an interview published this Sunday, the Historian of Havana, Eusebio Leal Spengler warned that “it is as important to recover the social fabric as [it is to recover] the city itself.” On Monday, the official press focused on the matter, stating president Miguel Díaz-Canel has urged that the housing program be given priority. Cases like that of Iraida Alberto continue to wait for those words to come true.